While your personal time may be filled with baking cookies and wrapping gifts, you may also be starting to think about some of your resolutions (and goals) for 2019. 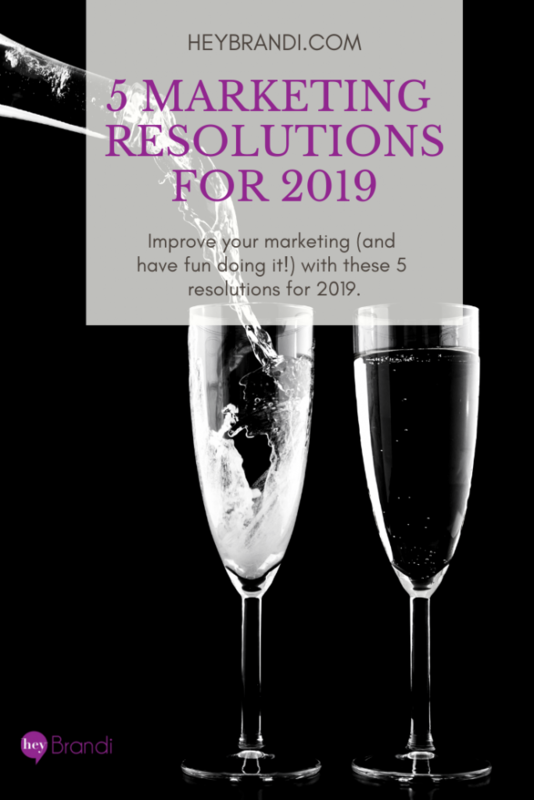 Today’s kicking off a 6-week series on five marketing resolutions you should make for 2019 – starting with an overview of the resolutions. Each following week, I’ll be doing a deeper dive into the resolution – including why it’s important and how to make it happen for you and your business. To give you a bit of food for thought, here are my top 5 marketing resolutions for my business (and yours) in 2019. I resolve to support my customers first. In this interview with marketing master Seth Godin, he challenges marketers in 2018 to “Be relevant, not loud.” By focusing on your customers first, you’re creating products with them in mind, not just because it’s what you want to create. A customer-first marketing strategy focuses on benefits to your customer with every marketing decision, from pricing to promotion to product creation. Learn more about customer-first marketing here. I resolve to be consistent. You probably won’t get washboard abs the first week that you’re working out. You’ll need to be consistent with your diet and exercise resolutions. The same is true with your marketing efforts. Your first YouTube video probably won’t pass 1 million views. The first week of your Facebook page often won’t drive thousands of dollars in sales. But with consistency, you can grow your business, reach a larger audience, and eventually reach that 1 million view mark or the thousands of dollars in sales. It’s easier to be consistent when you adopt resolution #2 and focus on 2 amplification platforms at a time. 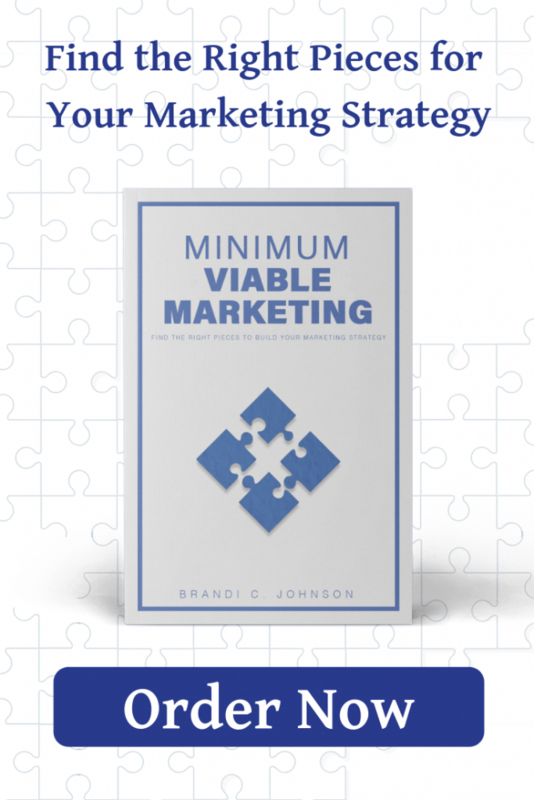 I cover more about how to manage your time and build consistency into your schedule in Minimum Viable Marketing. I resolve to trust the data. Our gut instincts about marketing can only take us so far – that’s why we need to learn to trust the data. Data gives you insights into how your prospects are responding to your efforts. You can see how they’re navigating your website, which emails they’re opening and clicking on, how much of your videos they’re watching, and which ads are driving more conversions. When you trust the data, you don’t have to guess what’s working – you’ll know. Your marketing gets easier when you trust the data to help you make better decisions. I resolve to make my marketing fun again. While all of the previous resolutions are important, this one may be my favorite. A lot of marketing is hard work. Figuring out what platforms you should use to reach your target customers, learning what all the data you get about your business means, not to mention actually creating your product, special offers and content to use in your marketing – it can be exhausting. (Trust me, after working in corporate marketing for 15 years, I could have been Rip Van Winkle.) But while it’s hard work – you have the chance to make it fun as well. Do the things you’re curious about. Take risks. Try out new headlines and new content formats. Do a live video or reach out for a collaboration. if you’re having fun, your customers will notice! So, what marketing resolutions are you making in your business this year? Connect with me over on my Facebook page (facebook.com/HeyBrandi) or let me know in the comments below!